The South Carolina Council of Teachers of Mathematics (SCCTM) recently hosted its three-day conference from November 14th through November 16th at the Convention Center. They were drawn—in part—to Columbia's thriving downtown, which offers all sorts of attractions to keep conference-goers engaged in their downtime. With close to 700 participants traveling from all across the state to network and share educational techniques, the Capital City's central location for travelers proved a major deciding factor for conference organizers. The SCCTM board says that on-the-ground support from the Convention Center team, as well as their innovative use of space, special visual enhancements to high-traffic venue areas, and other personalized touches took their event to the next level. "It quickly became clear that we could constantly count on the Convention Center team," SCCTM board member Leigh Martin says. "Their support proved to be invaluable." What else did the Convention Center contribute to make the event such a resounding success? Let's take a look. Convention Center staff worked with in-house Audio Visual Provider, SCAV, to install LCD TV screens at the top and bottom of the escalators. The screens featured equations for conference participants to solve. Math problems appeared on the bottom-level LED TV screen, with answers appearing on the top-level LCD TV screen. These encouraged a fun, easygoing atmosphere and stimulated conversation between attendees around a subject of shared interest. 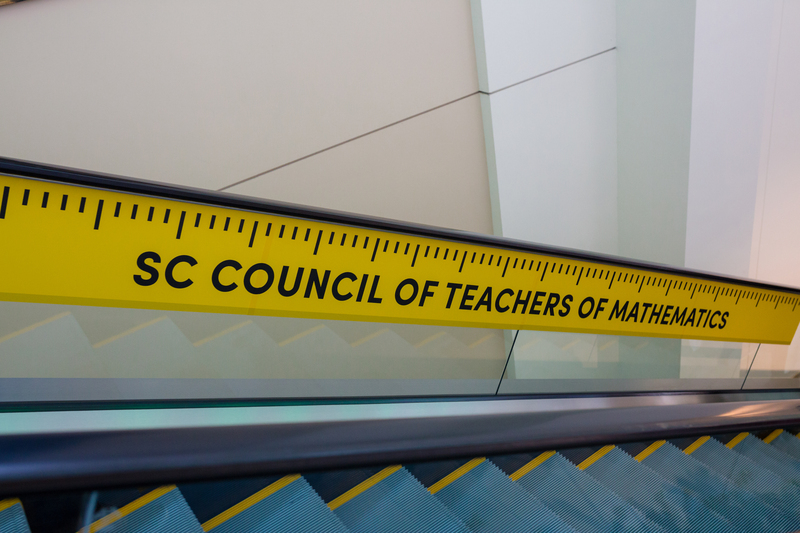 A fifteen-foot custom decoration, designed to look like a ruler, clung to escalator railings. Additional math symbols were adhered to the railing to lend even more charm to the space. With countless special sessions (of varying audience sizes, ranging from 20 to 200) going on simultaneously around the Convention Center, event organizers needed to make innovative use of available space to accommodate small group discussions, lunch breaks, and more. Hosting small-scale discussions in the open setup beneath the escalators inspired just the type of easygoing, informal atmosphere that conference organizers desired for their guests, with the unique setup stimulating dynamic conversation among conference participants. With close to 700 conference attendees staying on site to enjoy boxed lunches prepared by the Convention Center's in-house catering company, Spectra, finding space to accommodate a group of this size made things a bit tricky. Luckily, setting up lunch tables in the Exhibit Hall, while untraditional to say the least, turned out to be an excellent approach. Not only was there ample room for guests, the proximity to vendor displays—which were arranged throughout this particular space—encouraged visitors to examine the displays in greater detail, increasing interaction with vendors in a way that would have been unlikely had guests dined elsewhere. Ballroom - General session and keynote address. 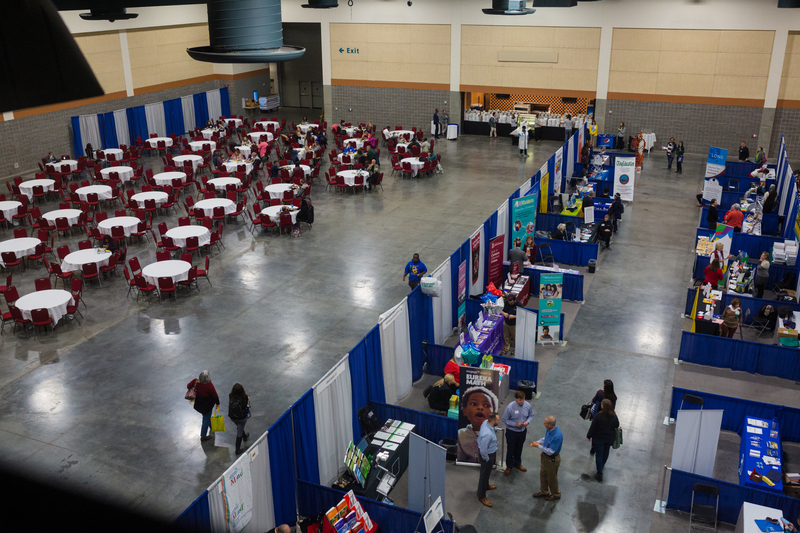 Exhibit Hall - Vendor booths, lunch tables, small classroom-style setup in the corner for breakout sessions. Carolina, Lexington, Richland, Congaree, Hall of Fame, Lincoln & Senate Rooms - Breakout sessions. Registration Area - Check-in station and informal lounge (furniture was installed throughout the space for this purpose). Spires Boardroom - Client office and board meeting space. Whatever your needs may be, whatever event planning challenges you may face, the team at the Convention Center is here to support you and your organization. When we work with clients, we make sure to offer on-the-ground, real-time support, just in case any of those unexpected event planning complications arise—like when the SCCTM's printer malfunctioned, and the Convention Center staff printed client documents from their offices so that keynote speakers would have the materials they needed to proceed. Here at the Convention Center, no request is too great. We're here to support you, and to troubleshoot issues both large and small. Get in touch with us today to discuss your event in greater detail.